Item # 314568 Stash Points: 3,995 (?) This is the number of points you get in The Zumiez Stash for purchasing this item. Stash points are redeemable for exclusive rewards only available to Zumiez Stash members. To redeem your points check out the rewards catalog on thestash.zumiez.com. With technical riding in mind, the sleek Real Oval Fade Burst 8.06" Skateboard Deck is primed for flip tricks. An extremely steep and wide nose provides additional nollie and switch trick pop, while a more mild pitched kick tail creates a quick and responsive pop, while also providing stable stalls with ease. Moderate concave throughout helps aid with flick strength on flip tricks and equally medium sized wheel wells create space for vert or street wheels so you can truly rip it all. 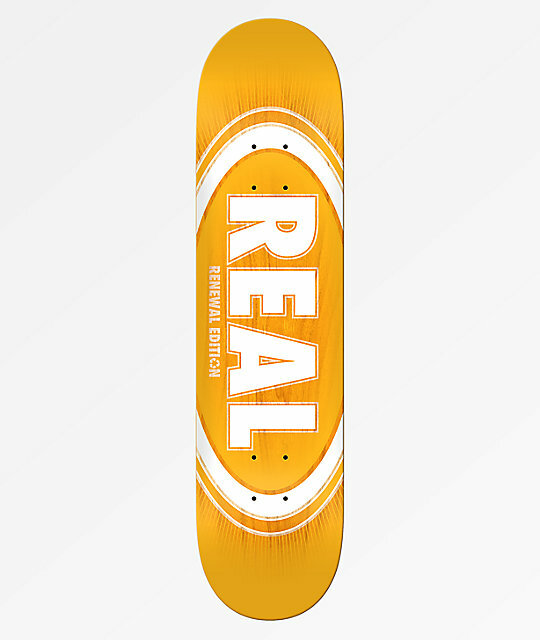 Oval Fade Burst 8.06" Skateboard Deck from Real.